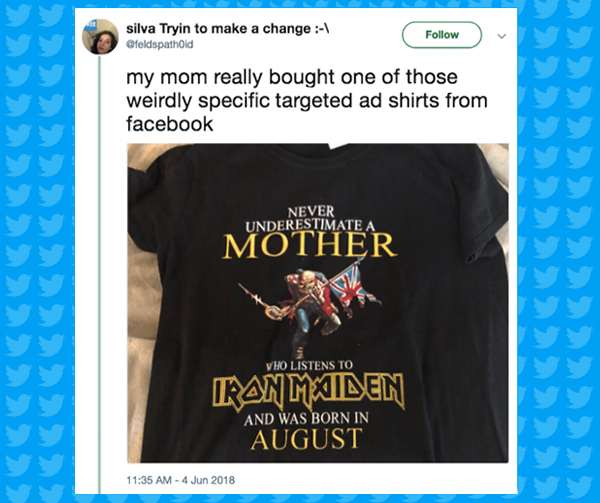 Chances are, you’ve seen similar t-shirts marketed to you on Facebook by people who seem to know exactly who you are, what you like, and who you love. Sometime in the Summer of 2017, Twitter user feldspath0id’s mom logged onto Facebook and was greeted with an advertisement that spoke to her soul. That’s me, she thought. I’m a mom! I love Iron Maiden! I was born in August! Without hesitation, she clicked through and bought it. Chances are, you’ve seen similar products marketed to you on Facebook by people who seem to know exactly who you are, what you like, when you were born, where you live, who you love, and what you do. Who makes these products? How on Earth do they manage to generate such specific phrases? And what happens when things go wrong? In 2011, Michael Fowler, a 20-year veteran of the t-shirt business, began to experiment with ways to generate more designs. At the time, his company, Solid Gold Bomb, had a catalog of around 1k t-shirts, each conceived by a human. But Fowler knew that the t-shirts were “a numbers game, a quantitative culture” — and to scale, he needed to dramatically increase his output. Using a wide range of starting phrases, the algorithm could spit out an endless array of t-shirts. And by printing on demand, he could maintain a virtual inventory without printing shirts until they were actually ordered. In short order, Solid Gold Bomb’s catalog ballooned to more than 22 million t-shirts. On Amazon, the company listed 550k+ t-shirts. The hyper-specific phrases were hit or miss with customers — but small sales, aided by targeted Facebook ads, added up to a cumulatively large sum. Soon, he was selling 800 shirts a day. The internet is rife with hundreds of fly-by-night t-shirt companies that operate in a similar fashion. After posting about alcohol and Harry Potter on his Facebook page, one user got an ad for a Beer-themed magic potion shirt. Another user who moved from Finland to Denmark starting getting personalized mugs in Finnish which hinted at her strained relationship with her mother. Most of these businesses use algorithms to generate massive, almost unlimited digital inventories (sometimes, 25m+ designs), then rely on hyper-targeted Facebook ads to reach niche audiences in small volumes. In 2012, the WWII propaganda phrase “Keep Calm and Carry On” was having a moment — and Michael Fowler decided to capitalize with a simple bit of coding. He began with the phrase “Keep Calm and ____,” then compiled huge lists of verbs (to replace “carry”), and prepositions/pronouns (him/her, on/off, etc.). In the end, he generated about 700 variations of the phrase on t-shirts, and put them up on Amazon. In a since-deleted apology letter, he harped on the downside of relying heavily on an algorithm with little human oversight — “The ‘Keep Calm’ shirts were computer generated, and we didn’t even know we had a shirt that says that,” he wrote — but it did little to assuage the internet’s fury. Amazon swiftly removed the offending t-shirts, and a few months later, Solid Gold Bomb went out of business. Fowler, a father of 3, was left wondering how his algorithm had betrayed him. This wasn’t the only time bot-generated products caused an uproar. Last year, an Amazon retailer by the name of “my-handy-design” made an unwelcome splash on the internet over its questionable iPhone accessories. The man behind the cases, a German computer consultant named Tobias Hartmann, had generated more that 31k products using a database of stock images. These mishaps beg an important question: in an age of retail governed by volume and scale, what happens to quality control? Back in the day, shelf space was expensive and retailers had to be selective about what they sold. Today’s digital retail space is an unfettered testing ground with virtually no limitations on volume. Amazon alone lists more than 580m products. The atomization of culture and business is nothing new. But as algorithms are making it easier to saturate the market with low-quality products, entrepreneurs should be wary of scaling virtual inventory without oversight. As Michael Fowler and others learned, big data comes with big responsibility — and big potential consequences.